- Cooperation with Law Firms based in Brazil, Africa, Russia, Germany, Panama, Italy, Luxembourg and others. He is also one of the responsible for the establishment of cooperation agreements with law firms around the world. - His main areas of practice include corporate, tax and financial law, particularly mergers and acquisitions, and international agreements, and tax planning. 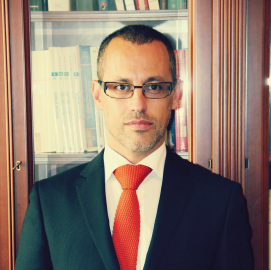 Paulo has also developed an expertise in the incorporation and management of companies licensed to operate in the IBC of Madeira, as well as providing legal assistance to them. - Coordinates business development activities, which include the identification of target markets and travels around different jurisdictions promoting structures of corporate and tax efficient solutions for clients, promoting scheme for Portugal's Non-Habitual Resident and Portuguese Golden Visa schemes as well as for ship and yacht registration in Madeira. These initiatives are opening up new markets. - In the past he also represented domestic clients in civil, commercial, administrative and tax proceedings and provided day-to-day consultancy to several clients on civil, commercial, administrative and tax matters. He also has experience in registry and notary practice. - Support in the Incorporation of family, charitable and assets protection Trusts.